Augustus Baldwin Longstreet (September 22, 1790—July 9. 1870). A Yale graduate with a long and very diverse career, Longstreet was also the first Southwestern Humorist. He is remembered primarily for a book of humorous sketches he began writing for the States Rights Sentinel, the Augusta, Georgia newspaper he owned and edited during the 1830’s. First collected and self-published in 1835, Georgia Scenes, Characters, Incidents, etc., in the First Half Century of the Republic was republished by Harper and Bros. in New York in 1840. Edgar Allan Poe gave the book a rave review and Georgia Scenes achieved great popularity. It has seldom been out of print since. 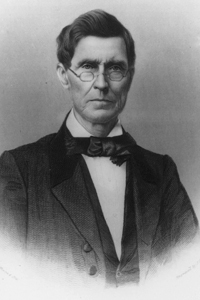 Longstreet was a planter, publisher, editor, lawyer, judge, legislator, Methodist minister, and president of Emory College, the University of South Carolina and the University of Mississippi. Although he was proud of the great popularity of the hastily written Georgia Scenes, he sometimes felt that it was not the kind of book by which a minister should be known. He also wrote a temperance novel, Master William Mitten (1859), but his fame was secured by his early humorous sketches in which, for almost the first time, he opened up the folkways of the backcountry South to literary use.